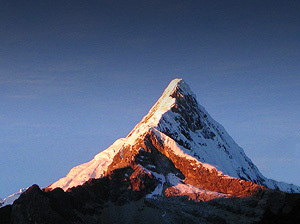 Artesonraju is one of the major peaks of the Cordillera Blanca. 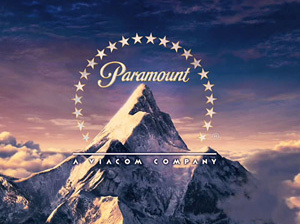 It's 6025 meter summit bears an uncanny resemblance to the "Paramount Pictures" mountain - the ideal summit. Coincidence? Or is there a connection? There are no easy routes up this peak. From whichever direction one attempts it, there is unavoidable steep snow and ice. Two "normal" routes exist, The North Ridge and the Southeast Face. Our choice on this expedition is the North Ridge. The route climbs a stepped glacier on the northeast side of the peak, eventually gaining the airy summit ridge, which is followed south to the top. The glacier has several steep steps, alternating with more moderate ground. The climb finishes with about 200 meters of steeper snow and ice before reaching the upper ridge. Descent is by the same route. Because the glacier changes from year to year, the nature and location of the steep steps may also change. Sometimes these steps are not overly difficult, but occasionally, they may present a serious technical ice challenge, with short sections of very steep ice. In addition to Artesonraju, we have also included an acclimatization ascent of Vallunaraju. This is a peak very close to Huaraz, 5686 meters high, and offers a straightforward, but very scenic glacier climb on its southwest side. We welcome non-climbing friends and family to join us on this program. While the climbers are busy, struggling away on the peaks, others can adopt a more leisurely set of activities. For example, on Vallunaraju, trekkers can come up to base Camp in the Llaca valley and overnight there with the climbers. The following day, non-climbers can explore the valley below the striking South Face of Ocshapalca, returning to Huaraz for the evening. The climbers come back to town the next day. For the Artesonraju portion of the trip, trekkers can join us to Base Camp, spending a couple nights there. 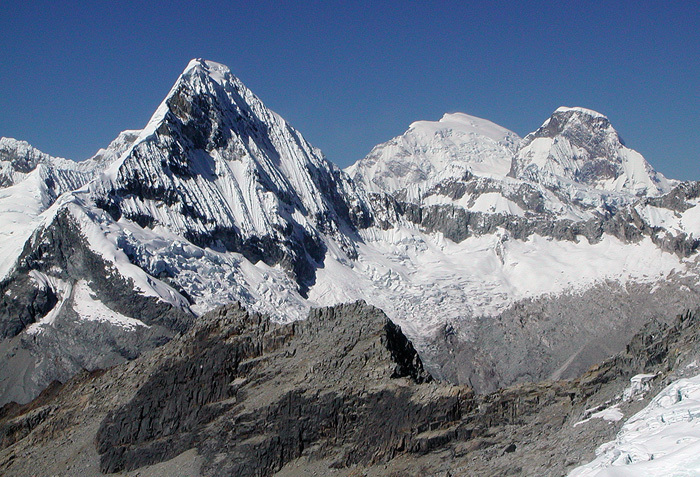 While the climbers move up the mountain the trekkers can continue with the famous Santa Cruz-Llanganuco trek. Trekkers would arrive back in Huaraz perhaps a week before the climbers, and could either return home, relax, or explore more of Peru. Let us know if you might be interested in this option and we can discuss some of the possibilities. 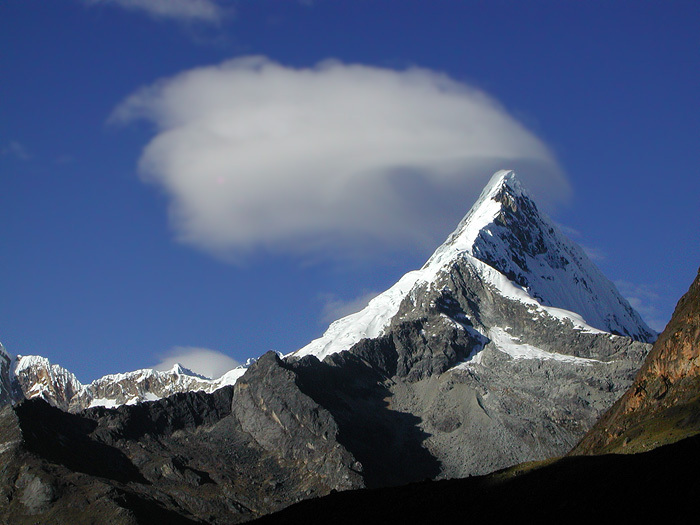 Artesonraju is a difficult summit, comparable to Alpamayo, or perhaps even slightly harder. Though we will have porter help to the higher camps, the high altitude, in combination with the very technical climbing requires a high degree of fitness and climbing ability. Climbers need to be in excellent physical condition, and have experience both in alpine ice as well as waterfall climbing. Participants should feel comfortable following Grade 4 ice climbing. They should be comfortable following on slopes up to 60 degrees in steepness. Previous high altitude experience (to a minimum of about 6000 meters) is required. Artesonraju's NE Face. Mouse over to show the North Ridge route. Fly to Lima. Many travelers take a late night flight out of Miami, arriving in Lima very early in the morning the next day. 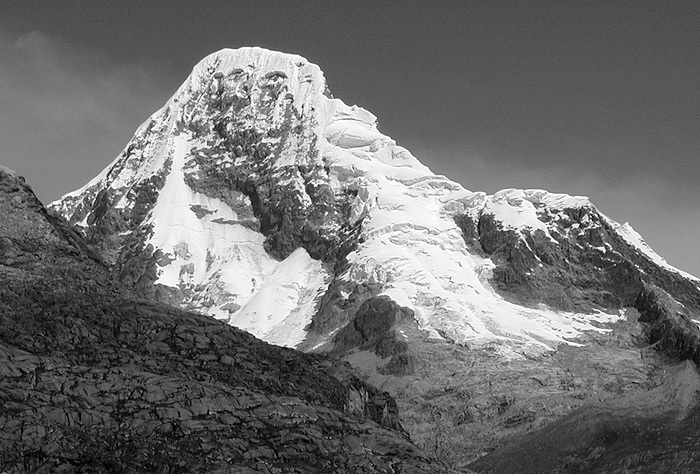 Day hike in the are around Huaraz. Here, we have a number of choices. Laguna Churup is one common destination. However, if participants have already been to the lovely lake, we may elect to hike in the Cordillera Negra instead. Our choice will depend on the interests of the group. We'll make a leisurely start to this day, as our goal of reaching Base Camp in the Llaca Valley is easily accomplished with the aid of our van. Base Camp is in a grassy meadow at about 4400 meters. We'll take it easy in the afternoon due to the sudden increase in altitude. But if we like we can talk a short walk up-valley to see the impressive South Face of Ocshapalca and the southwest side of Ranrapalca. Another short day, we climb up to a high camp on Vallunaraju at about 4900 meters. We'll have porters help us with our gear for this short but steep climb on the southwest side of the peak. With an early start, on Day 5 we climb Vallunaraju. The route climbs easily up the initially gentle glacier, before gaining the upper ridge with one steeper step. 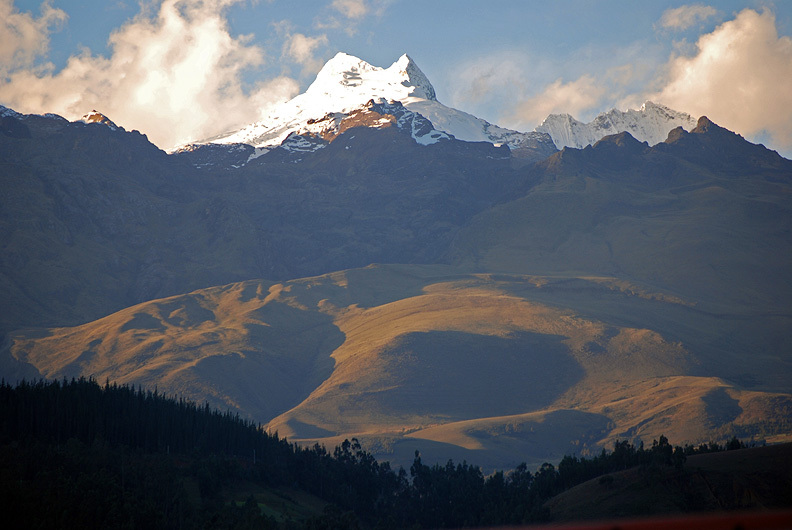 We'll descend back down to the location of our Llaca Base Camp, meet our van and continue down to Huaraz for the night. Leaving early we drive to the northern end of the range to the town of Cashapampa. This is where we begin the two day trek to Base Camp. After loading our gear on burros, we set out carrying only light day packs. We enter the valley of the Rio Santa Cruz, narrow at its entrance but widening as we climb further into the range. After about a 6 hour walk (including breaks) we arrive at our first camp, Pampa Ichicocha at 12,630'. On our second day of trekking we reach Base Camp for Artesonraju. It is located at about 4200 meters in a quiet valley to the side of the standard trekking route over Punta Union. We have allowed parts of 10 days for our climb of Artesonraju. The exact itinerary will depend on how we are feeling, the route, and the weather and snow conditions. We plan on establishing two camps above Base, one on the moraines at about 4800 meters, and another on the glacier above. Return to Huaraz. We can hike out from Base Camp to Cashapampa in one long day. We'll meet our van there, and drive back to Huaraz. 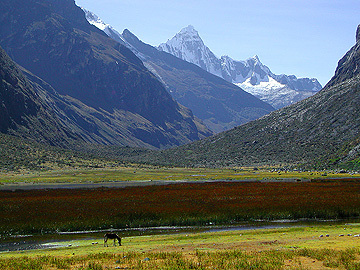 Vallunaraju as seen from Huaraz. The view of Artesonraju from about 5000 meters on Alpamayo.